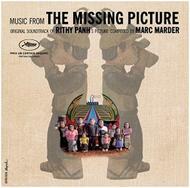 Composer Marc Marder meets his favourite Cambodian director Rithy Panh again. We find in his soundtrack many worlds which blend: various rhythms are changing according to sequences, adapting themselves to the screen. The composer also uses many instruments, including guitar, percussion and violin. Director Rithy Panh uses clay figures, archival footage, and his narration to recreate the atrocities Cambodia's Khmer Rouge committed between 1975 and 1979. Film released in the UK on 3 January 2014.